SRK, Cyrus, Chammak Challo and a red dupatta. 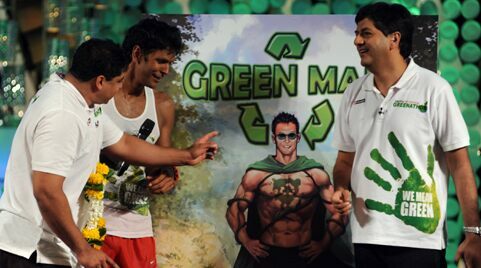 Marathon man Milind Soman completes 1500 km run from Delhi to Mumbai. Priyanka, Parineeti dance to Desi Girl. NDTV-Toyota Greenathon 4: Thank you for helping us raise Rs 8.89 crore and for lighting up 508 villages. Aamir does the bhangra with Ayushmann. Item queen Malaika Arora Khan performed her hit song Anarkali Disco Chali from Housefull 2. Footloose Shahid Kapur rocks Greenathon. Sridevi does a Hawa Hawai for G4.